The rural charms of a rolling green patchwork of farms paired with a coastline of sandy beaches and wildly eroded cliffs studded with lighthouses is a hard combination for tourists to resist. 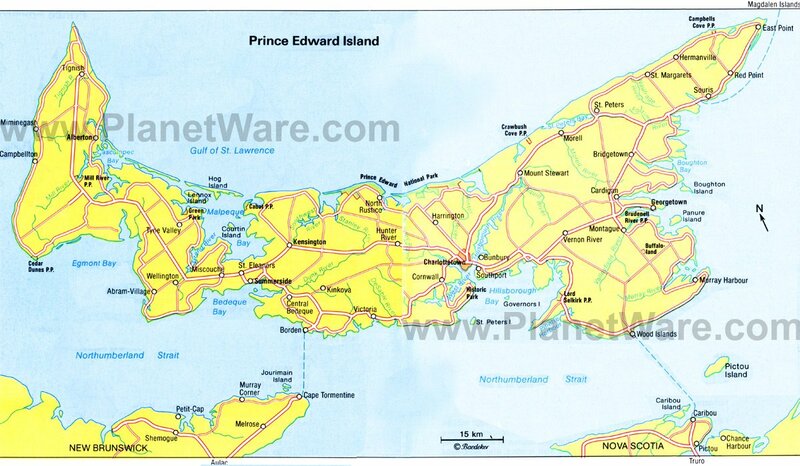 Add attractions like the home and setting for one of the most beloved characters in children's literature, a seaside National Park, and a bicycling trail from one tip of the island to the other and Prince Edward Island (PEI for short) has rewarding things to do for every type of tourist. PEI is the smallest province in Canada and one of its loveliest. A Micmac First Nations legend tells how the god Glooscap painted all of the world's beautiful places, and then dipped his brush in every color and created Abegweit, his favorite island. And thanks to its position in the Gulf of St. Lawrence, the island has pleasantly moderate temperatures. Prince Edward Island National Park occupies much of the island's central, northern coastline. Three sections of the park offer beaches, wildlife watching, outdoor activities, historic buildings, and other attractions. Campgrounds and picnic areas cater to families and outdoor lovers. In the park's central portion, Dalvay-by-the-Sea historic house was once a regal summer home and is now a hotel and restaurant near Brackley and Stanhope Beaches. At the eastern end of the park, beyond St. Peters Bay, the more isolated Greenwich area offers the solitude that the rest of the park lacks, with a dune-backed beach and boardwalk trails that are well suited to bird-watching for the park's 300-plus species. The Gulf Shore Parkway follows the coast through the central section of the park, then continues on the other side of New London Bay from North Rustico to Cavendish as the Gulf Shore Parkway West. Hugging the shoreline for most of its length, the park includes two inland segments at Cavendish to accommodate Green Gables and Eagles Glenn golf courses, and the heritage site of Green Gables (see attraction 3, below). Charlottetown has a Victorian-era charm and a surprising small-town feel. Heritage buildings, including the ornate St. Dunstan's Basilica and elegant Beaconsfield Historic House, line the city streets. The Confederation Centre of the Arts is the city's major cultural hub with an art gallery, museum, and theaters, where the Anne of Green Gables musical is performed each summer. Across the street from the center sits Province House National Historic Site, which hosted the Charlottetown Conference in 1864 to discuss confederation. PEI didn't actually join the union until 1873. A highlight for visitors is the pretty Victoria Row, a traffic-free street of well-kept Victorian buildings, south of the Confederation Centre of the Arts. Many of these former homes now house boutiques and restaurants. A lovely pathway fronts the harbor and leads out to Victoria Park, the location of historic fortifications at Prince Edward Battery. You can get a good orientation of this charming city from a double decker bus, on the one-hour City Highlights Bus Tour of Charlottetown. You'll see all the major sights: Province House, Beaconsfield, Historic Great George Street, The Lieutenant Governor's House, Victoria Park, and charming residential areas, with commentary from your local guide. As Juliet has done with Verona, the fictional Anne of Green Gables has so captured readers' and viewers' imaginations that she has imbued the setting for her story with a magic of its own. Anne's author, Lucy Maud Montgomery, lived in Cavendish, and it became the mythical Avonlea of Anne's girlhood in her 1908 book that begins the series. The green-roofed farmhouse, Green Gables, and surrounding land belonged to Montgomery's uncle and she visited often as a child. It is now a National Historic Site. Also in Cavendish, you can tour the grounds of Montgomery's childhood home, where there is a collection of her works for sale. With a somewhat theme park atmosphere, Avonlea Village is a cluster of eating places and shops in replica (and a few original) buildings based on the village described in the books. The gardens are quite beautiful. In New London, you can visit Lucy Maud Montgomery's birthplace and see her personal scrapbooks with some of her stories and poems. There's an Anne of Green Gables Museum at the Campbell Homestead in Park Corner with a collection of Montgomery memorabilia and carriage rides around her model for the Lake of Shining Waters. Opened in 1964 as a monument to Confederation, this cultural institution houses an art gallery, museum, and two theaters. The Confederation Centre of the Arts presents the Anne of Green Gables musical each summer, part of the annual Charlottetown Festival. It's just across the street from Province House National Historic Site, the famed setting for the 1864 Charlottetown Conference, where the idea of Canada was born. In addition to their full schedule of theatrical and musical performances, in July and August the Confederation Players conduct Walking Tours. The players, costumed as the Fathers and Ladies of Confederation, stroll down Charlottetown's historic district as they put the leaders and times of the Confederation into cultural and historical perspective. Points East Coastal Drive explores the eastern end of the island where beautiful beaches, rare dune systems, and lighthouses mark the coastline. Along the drive, which is well marked, are six lighthouses that are open to visitors in the summer, each with its own story to tell. Wood Islands Lighthouse, located near the ferry terminal in Wood Islands Provincial Park, has exhibits about the area's seafaring history and serves as a lookout point. Point Prim Lighthouse is the island's oldest and Panmure Island Lighthouse is PEI's oldest wooden lighthouse. Cape Bear Lighthouse is said to be the first Canadian land station to receive the distress signals from the Titanic. Souris Historic Lighthouse has an interpretative center with history of the light and port, as well as exhibits on the formation of sea glass. At the scenic drive's end, East Point Lighthouse has an elevated vantage over mixing tidal waters. Other sightseeing attractions along the drive vary widely. Orwell Corner Historic Village recreates a late nineteenth century setting (including a historically furnished farm, shingle mill, church, store, and community hall). Elmira Railway Museum, once the end of the line for the island railway, displays photographs and artifacts from the rail-era. The museum also features a recreated stationmaster's office and ladies' waiting room. This beach and provincial park on Points East Coastal Drive is an action-packed spot. Visitors delight in scuffing their feet along the sands to try and create a distinct "singing" noise, and the squeaky beach is nicknamed Singing Sands. The squeak is caused by the high amount of silica and quartz in the fine sand. Basin Head beach stretches for miles, and its warm summer waters are perfect for swimming. Beyond the most popular area, where there are showers and picnic shelters, is plenty of beach for walking and beachcombing in solitude. In the summer, PEI Wildlife Federation offers interpretive Beyond the Beach experiences that allow you to explore the usually unseen part of Basin Head's Marine Protected Area and the sand dunes and aquatic life of the lagoon. Also in the provincial park, Basin Head Fisheries Museum presents exhibits about Prince Edward Island's inshore fishery. Completed in 1997, Confederation Bridge crosses the Northumberland Strait, for the first time connecting Prince Edward Island to mainland Canada and fulfilling the promise of a permanent link made when PEI joined Confederation in 1873. Prior to the bridge, the only crossing was by ferry here or at the eastern end of the island at Wood Islands. The 12.9-kilometer bridge is the world's longest over freezing water and considered one of Canada's top engineering accomplishments of the 20th century. Crossing the curving bridge from New Brunswick is a thrilling experience, and the first town visitors reach in PEI is Borden-Carleton, from which you get the best view of the majestic bridge. North Cape juts upward into the Gulf of St. Lawrence like a sharp-pointed arrow, with North Cape Lighthouse at its tip. This entire western end of the island, from Cedar Dunes Provincial Park in the south to North Cape, is less visited than the rest of PEI, which gives its small towns and countryside a quiet almost undiscovered feel. Route 2 draws an arrow-straight line through its center, but the most scenic way to explore it is along the 350-kilometer North Cape Coastal Drive, a signposted route that follows the coast from one scenic outlook and tiny village to the next. The high red sandstone cliffs have eroded into ragged shapes in places, in others dropping to small sandy beaches. Along the way are plenty of places to eat seafood, or you can take to the water in a kayak or on a deep-sea fishing excursion. Intense winds make the blustery North Cape an ideal setting for towering turbines, turning the abundant wind into energy at one of Canada's leading wind test institutes. North Cape Interpretive Centre has exhibits that explain the process. Nature trails and the North Cape Lighthouse are near the wind farm. When the trains stopped running in Prince Edward Island, it opened up a new opportunity: for a 273-kilometer rolled stone dust trail that crossed the island from end to end. Side trails increase the network's total length to 435 kilometers. The main trail runs from Tignish in the northwest to Elmira in the east. Smaller trails branch to Charlottetown, Wood Islands, Souris, Georgetown, Montague, Murray River, and the Confederation Bridge in Borden-Carleton. The flat and well-maintained routes are open to walkers, runners, and cyclists. And as the trail was originally a rail bed, there are no steep hills and no more than a two percent grade. Bike rentals and shuttles are available. A tiny fishing village today, Victoria-by-the-Sea enchants with its waterfront fish shacks, colorful take-out stands, and small lighthouse. In the late 1800s, the scene was much busier, with three wharves supporting a steady stream of sailing ships, part of a thriving trade with Europe, the West Indies, and East Coast ports. Steamboats brought tourists for seaside vacations. Today, a theater, chocolate shop, fishing wharf, and Victoria Seaport Museum are favorite tourist attractions in the friendly community. The red sandstone cliffs along the Northumberland Strait coast are constantly eroding, which has resulted in expansive red-sand flats at low tide. More than 25,000 glass bottles form the walls and design features of the light-filled buildings known as The Bottle Houses. A quirky artist and builder, the late Édouard Arsenault used colored bottles to construct a six-gabled house, a hexagonal tavern, and a chapel furnished with pews and an altar. It's all built from glass and cement. This ultimate recycling project began in 1980, with bottles Arsenault and his daughter Réjeanne collected from a local restaurant, community dance halls, friends, and neighbors.